The Creative Real Estate Marketing Equation: Motivated Sellers + Motivated Buyers= by Make Profits Easy LLC at Spring Brook Audio. Hurry! Limited time offer. Offer valid only while supplies last. In order to be a successful real estate investor and entrepreneur you must understand the following principle. Real estate marketing is the business. In order to be a successful real estate investor and entrepreneur you must understand the following principle. Real estate marketing is the business. As a real estate investor you are in the business of marketing first and foremost. Marketing drives the business. It is the fuel that produces the leads and prospects you need to sustain and thrive in your business. Without it you are like a car without gas, you are going nowhere. 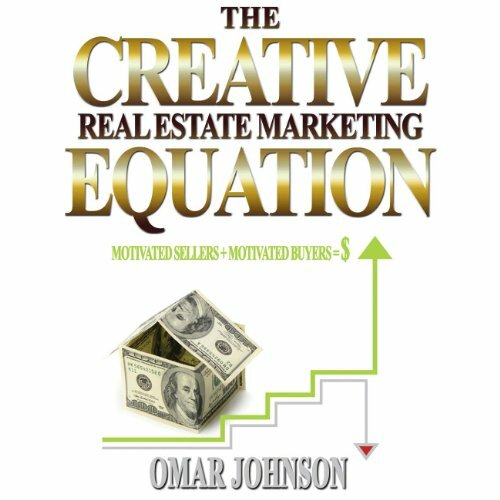 In his book entitled The Creative Real Estate Marketing Equation: Motivated Sellers + Motivated Buyers = real estate marketing expert Omar Johnson shows you step by step how to market your real estate business so that it produces consistent, sustainable and explosive profits. In his book he gives you the ultimate blueprint on how to strategically find motivated sellers and motivated buyers of real estate because they make up the essential part of the equation that translates into dollars. If you are in the arena of creative real estate investing and practice such creative real estate investing strategies such as lease options, owner financing, short sales, wholesaling etc., then this book will serve you well. If you're into real estate in general and you want to learn some killer real estate marketing strategies that you can immediately apply to your business then this book will also serve you well. For instance, you will learn 50 secret insider techniques and places you can use to start finding motivated sellers deals immediately. You will also learn how to create a killer buyer's list from scratch and how to master the three stages of the real estate buying process. View More In Buying & Selling Homes. If you have any questions about this product by Make Profits Easy LLC, contact us by completing and submitting the form below. If you are looking for a specif part number, please include it with your message.